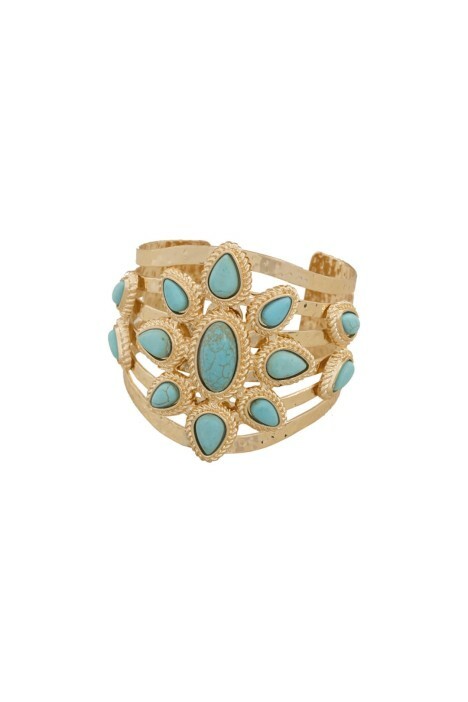 This stunning cut-out cuff features turquoise tear drops set in gold-toned metal. This cuff would look great with a print for bohemian look or with a simple evening gown as a stand-out piece! Rent with a stunning floor-length gown as a statement piece or with an unforgettable abstract print for a bohemian look. Hire a flirty cocktail mini dress for an understated look, and rent a statement clutch to top it all off! For more exclusive cocktail outfit inspiration, check out our 'Cocktail Event Style Guide' blog post!